ANY LAB TEST NOW® offers fast, affordable, anonymous, accurate STD testing. All of our tests are 100% confidential and only you see the results. No doctor referrals or insurance needed. No unwanted questions. Just the tests you need when you need it without delay. 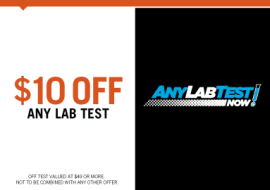 ANY LAB TEST NOW® is revolutionizing the health care industry by offering direct-to-consumer local laboratory testing services that provide a convenient, confidential, reliable and affordable way for consumers to take control of their health care costs and provide them complete access to their health information. You will be seen in 15 minutes or less with most results back in 24 to 48 hrs!!! it is our goal to make STD testing affordable for everyone. Our tests are extremely affordable with no hidden charges, taxes or draw fees for blood. You receive most results fast and within 24 – 48 hrs. You can decide how you want to receive them. We can either call you and you come to pick them up or we can email, mail or you can look them online. There are thousands of medical lab tests. But there’s only one way that’s the most efficient way for any consumer area to go. And that’s right here. At ANY LAB TEST NOW®.